Graven Games posted up a new review. This time it's for some 28mm handmade crates. Welcome to today’s review in which we are looking at a neat little set of handmade crates we found on eBay from user Karl7582. 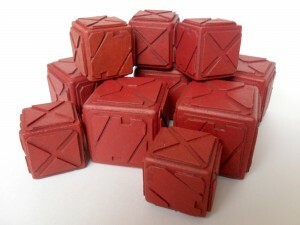 These handmade crate sets are a really useful accessory for 28mm sci-fi wargames such as Warhammer 40k, Necromunda, and Infinity, providing simple cover to hide behind or objectives to try and control. We find that simple terrain accessories like this are always useful to have access to, as they can be used in many ways in our games.